Ellsworth Adhesives expands its product portfolio with the addition of the new Dymax 9100 range. Now available for purchase from Ellsworth Adhesives Europe, the new Dymax 9100 series of light-curable encapsulants reaches full cure in shadowed areas and prevents rejects with its quick tack-free curing. Dymax Dual-Cure 9101, 9102, and 9103 are resilient, chip-encapsulant materials designed with a UV/Visible light and secondary ambient moisture-cure system, making them perfect for encapsulation applications where shadowed areas are present. No refrigeration is required for transporting the uncured 9100 materials, therefore no additional associated costs are incurred. The 9100 series materials cure tack free after UV cure, so boards can be handled sooner with less potential for damage. Once cured, the materials are flexible and expand with heat, reducing stress on board components. The two-day moisture cure – versus the seven days typical with other systems – shortens the time for further handling as well as final testing and assembly. The three new products in the 9100 Series have varying viscosities of 7,000, 17,000, and 25,000 cP, allowing for performance and dispensing to be optimized. In addition, the new materials are jet dispensable for more accurate placement and more efficient material usage. Ellsworth Adhesives offers the very latest in dispensing technology, including the new TS9000 Series Jet Valve by Techcon. 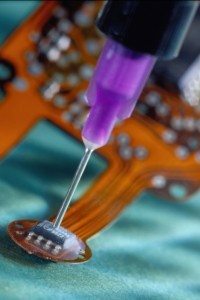 The addition of the new 9100 series from Dymax further extends Ellsworth Adhesives impressive product range of printed circuit board assembly materials which includes silicones, conformal coatings and encapsulants as well as UV curing resins and other related products. This entry was posted in Enclosures, Enclosures, Europe, Global, On Ticker, top articles, UK. Bookmark the permalink.